German tuning outfit Manhart has just revealed this: the MH2 550. 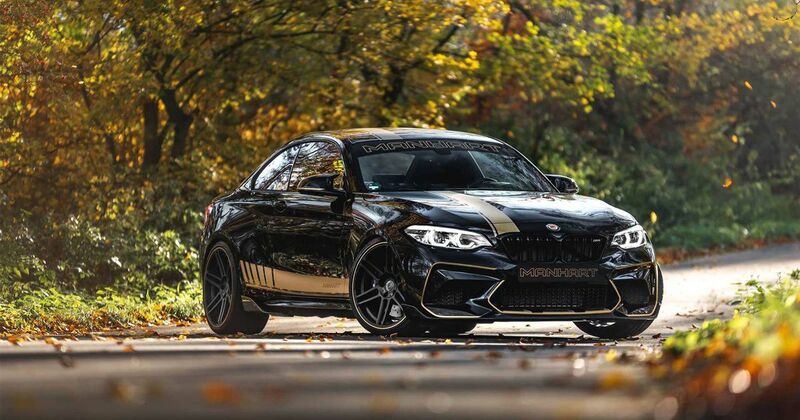 If you have sight and you’re familiar with Manhart’s naming culture from the likes of the MH5 700, you’ll be able to work out that it’s based on the BMW M2 and has a very tasty 550bhp to play with. 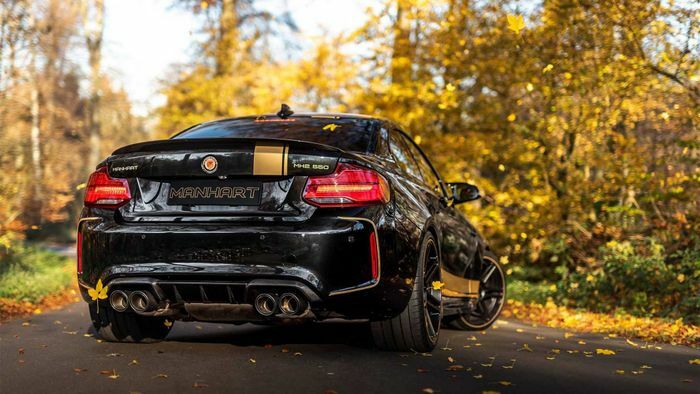 The black and gold exterior styling is Manhart’s thing just as much as it was Lotus F1’s in the days of yore. Over the black body and black wheels, gold stripes trace the wheel rims, front vents and grille, while fatter stripes adorn the sides, bonnet and roof. We’ve seen the style before on Manhart’s i8 concept, among others. 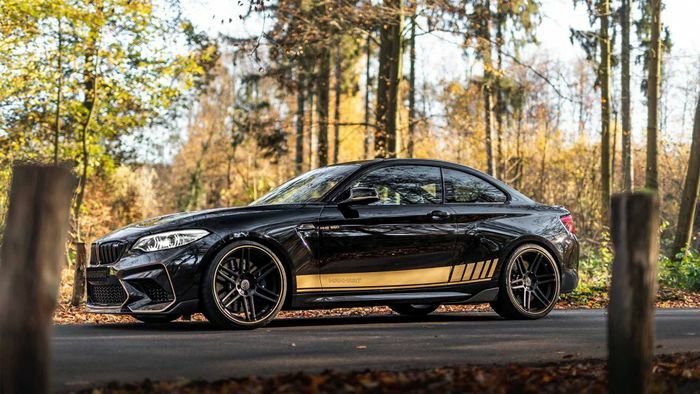 As we already know, the M2 Competition ditches the N55 straight-six of the cooking-spec M2, which was at its reliable limits, for the tougher S55 item straight out of the M3 and M4 and then detuned a bit. Manhart has turned the wick back up, and then some. Apparently it’s just an ECU tune rather than upgraded parts as per the MH2 Clubsport. The whole shebang sits around 25mm lower than the M2 Competition courtesy of KW lowering springs. We don’t know if they or the dampers have been retuned for the new setup, but we’d hope so. At the suspension’s ends are four new six-double-spoke wheels of 21 inches across. Shmee150 is the man at the helm, describing an engine that’s tuned to give more torque higher up the rev range, almost like a normally-aspirated car. Torque is not a problem, though: 590lb ft of it means that even in the dry the rear-driven MH2 550 threatens to spin its wheels. In third gear. There seems to be a whole angry character to the car over and above what BMW intended. Sure, it’ll be harder to manage towards the limit and sure, it’ll probably even be slower in the real world because you’ll be more scared of it, but we bet you’ll feel 100 per cent alive behind the wheel. For that reason alone, we approve.